Today morning went busy-busy.As laky started going to school after 2weeks vacation.In morning i was running behind her to get her ready and to pack snack and lunch box.Coming to the recipe i have prepared Mixed veggies stuffed in capsicum with cheddar cheese topping.Actually i saw this recipe in Savitha’s Kitchen.Where she used potato stuffing.But here i changed ingredients according to my taste and prepared it.We had it with rotis and it went delicious.Especially my laky liked the stuffing with cheese. Wash and cut the top layer and remove seeds to make it hallow. Heat a pan with oil,add cumin seeds once they splutter add chopped onions and fry till they turn into ligth brown colour. Add frozen veggies along with cumin,chilli powder and salt.Mix well. Once veggies are cooked add cumin seeds pwd and mix well.Add chopped coriander before removing from the hob. 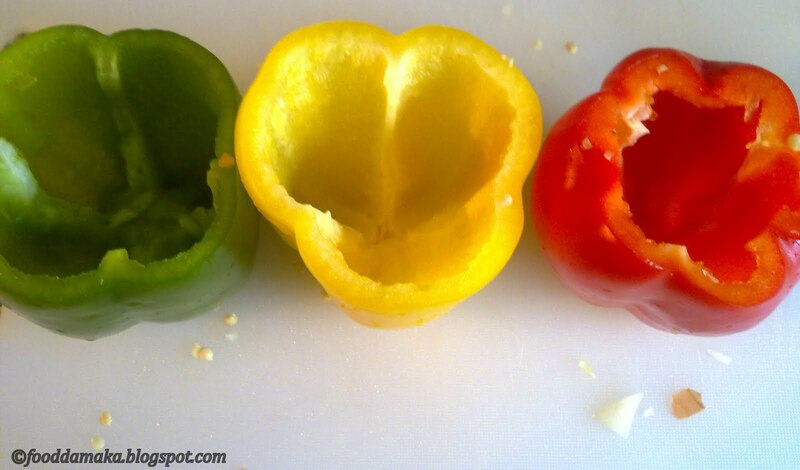 Wash and cut the top layer of capsicum,remove the seeds and make it hollow.Brush oil in and out of the capsicum. 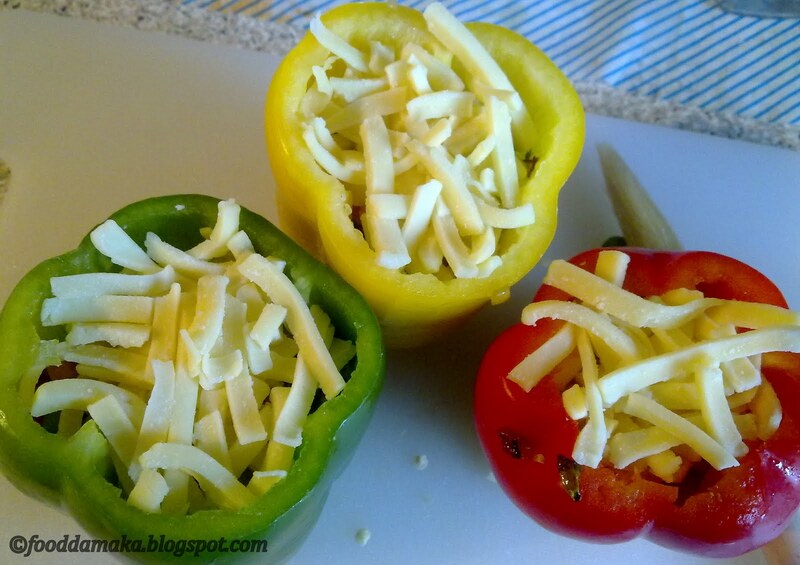 Take a spoon full of stuffing and fill it inside the capsicum.Now top with cheddar cheese. Pre heat the oven for 250degrees. 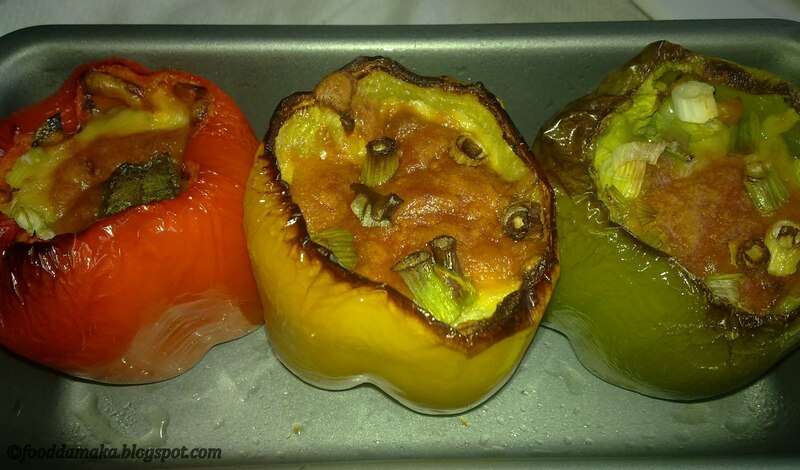 Place the stuffed capsicum on a tray and bake it for 30 mins or until the outer layer of capsicums/bell pepper shrinks.In between brush the capsicum with oil. Serve with rotis and enjoy! Easy and yummy! Love the stuffing and your lovely click..
That looks perfect for rotis and wonderful preparation.Thanks for mentioning dear…. Very yummy and drool worthy stuffed capsicum..
Looks soooo good. Cheesy & yummy. Stuffing without the potato sounds good, love the gooey top! Wow! Looks very colourful and attractive. 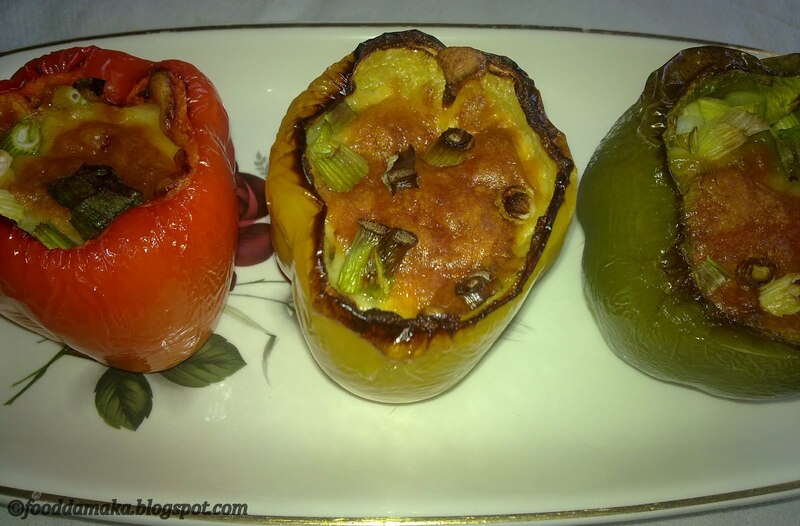 Stuffed capsicum looks delicious Pavani. Yumm, stuffed capsicums looks super delicious..makes me hungry.. Simple, tasty and healthy …lovely pics ! 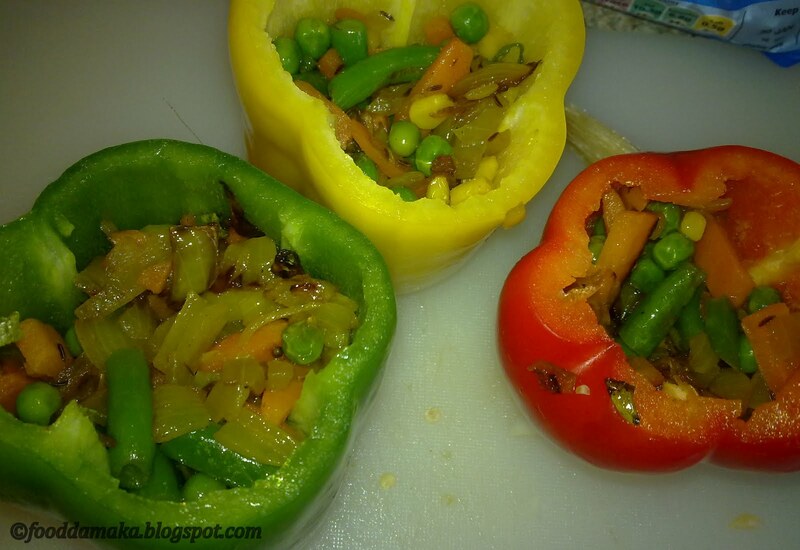 yummy stuffed capsicums…colorful,delicious and healthy…. Very tempting! First time here and love your blog…. Delicious!! Love that you used coloured sweet peppers too!!! This looks so good and cheesy! yum!